Her destiny was written for her, long before she was ever born. She embraced it, wanting nothing more than to give everything within her back to the sport in which she was con- sidered royalty. Her family’s legacy would live on, revered by all. And she thrived on the long work days she spent teach- ing at the academy her blood was tied to. Alexandra Sterling needed that dirt track as much as she needed her next breath. That same track was the one that drew in a young student years before. Alex had given her heart away the day they met, knowing that he belonged to only her. For years she’d waited, knowing without a single doubt that he’d make her his when the time was right. Dallas Hunter is a pro rider on the motocross circuit, following in the footsteps of his father Eli. For Dallas, it’s always been Alex, but he’s kept his feelings locked away out of fear, his love for their family, his biggest obstacle. One short and chilling phone call to her puts him on high alert. 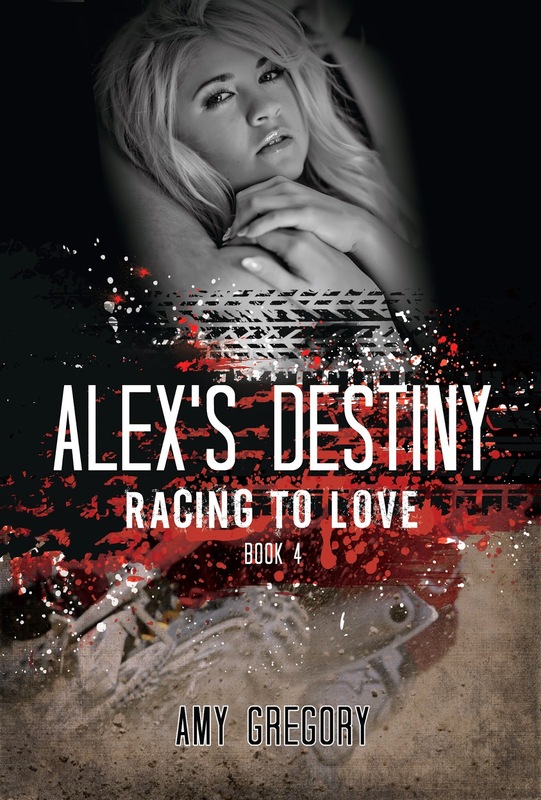 Knowing something is terribly wrong sends him racing across the country, back home, back to her. But what he finds almost kills him. Now he’s watching her slip away right before his very eyes. Figuring out how to help Alex before it’s too late, might turn out to be harder than any race he’s ever ridden. And he has to do it with his team and sponsors screaming at him from the other side, trying to pull him back to the world he’s dedicated his entire life to. Dallas knows he has to help his best friend, the woman he loves…and do it without tearing his family apart. Years of roaming every inch of the Noland property left an intricately detailed map ingrained in her head, memorized for life. Instead, she stayed, not wanting to be rude to her family. As she stood there, the sun gave way to the moon. The dark purple lining the horizon was the only evidence it left behind. She couldn’t help but feel her heart break. Not the earth-shattering pain of a sudden loss, or that at the mercy of death, but a slow, piece-by-painful piece kind of heartache. The kind where emotions whirled around inside her, at war with one another. Feeling stupid, desperate, and confused, she tried to remember when she knew. There wasn’t some crystal clear moment. Not a black and white answer. Dallas had just always been hers. She never questioned it, never saw their ages as an obstacle, and until this week, she didn’t think he had either. Alex just knew Dallas would wait for her. That was what hurt the most. Well, two things actually. Being wrong—and being empty. For the first time she felt hollow and questioned her entire path. Her foot slipped, landing hard on the ground below the fence. She shook her head and closed her eyes. It was supposed to be Dallas. He would retire from rac- ing and join the staff of the academy. They were supposed to have the big white wedding. They’d spend their years teaching side-by-side as the fairy tale ending lived on around them. There’d been no question in her mind over the years. All she knew was there wasn’t supposed to be a different woman in her spot by his side. Feeling the sting, she screwed her eyes tighter then swiped at the tears that fell, despite her best effort to prevent them. The hand on her lower back made her flinch in surprise. She’d been so lost in her own world she hadn’t heard him approach. Without a word, she knew the scent, the hold was one she’d felt a million and one times. She tried to be angry, to hold onto the feelings that made her flee the house in the first place. She couldn’t. At his touch, even through clothing, his warmth melted the ice in her veins that quickly formed during the last few minutes of solitude. Another tear—another swipe at it. Suddenly his touch burned her, seared her. Jerking away from the source of pain left her standing face-to-face with him. “You don’t love her, Dallas.” Her mouth fired off the accusation before her brain engaged. Either way, the words were spoken. His silence was deafening. The admission painful. However, she knew she’d been right, even with- out seeing the narrowing of his eyes or the flare of his nostrils. He’d never lied to her—ever. And she knew he couldn’t start now. His mouth twisted, his brow knitted tighter. In the glow of the light from the shop, she saw his torment as he searched for words. He didn’t have to. Alex saw the answer in the gray eyes she knew so well. Her imaginary world had been just that—totally one-sided and in her head only. The security and love she’d felt from him over the years vanished, and the foundation of her world crumbled. The walls started to shift. Her heart was breaking, the cracks deepening at warp speed. 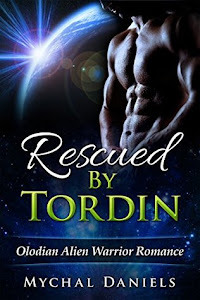 The command was crisp and the deep tone had her body reacting to his order. Frozen to her spot, she stood ab- solutely still. It could’ve been because of shock—it wasn’t. 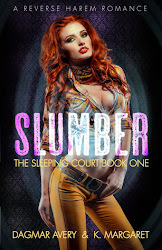 The pounding in her chest left her reeling. He held her tightly by her upper arms. Unable to move, she shivered in his hold. Her eyes flared as she clenched her fists at her sides. “You made your choice.” She spat out as she twisted in his hold, trying to free herself. He gave her a light shake, after a long minute she realized she was going nowhere until he decided to let her. Gritting her teeth and panting in anger, she glared at the man she’d spent a lifetime loving. It wasn’t anger she saw mirrored in his eyes. Embarrassed, hurt and frustrated, she yanked out of his hold. Turning, she stepped away in the opposite direc- tion, but not before she heard his last comment. Stalling, her shoulders deflated. There was nothing more to say so she continued walking away. Away from her past, her present…and away from her future. 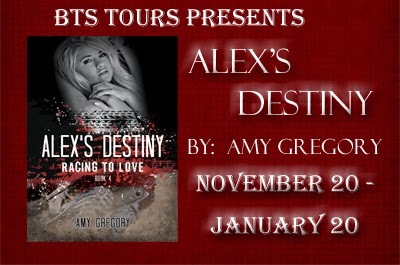 Amy is giving away an Autographed Print Copy of Alex's Destiny and swag, a $10 Amazon card, and an E-copy of Alex's Destiny!! Just fill out the rafflecopter for your chance to win!! What comes first the title or the story? Do you listen to music when you are writing? What authors have inspired you to evolve in this direction? I can't wait to read this book it sounds off the chain.